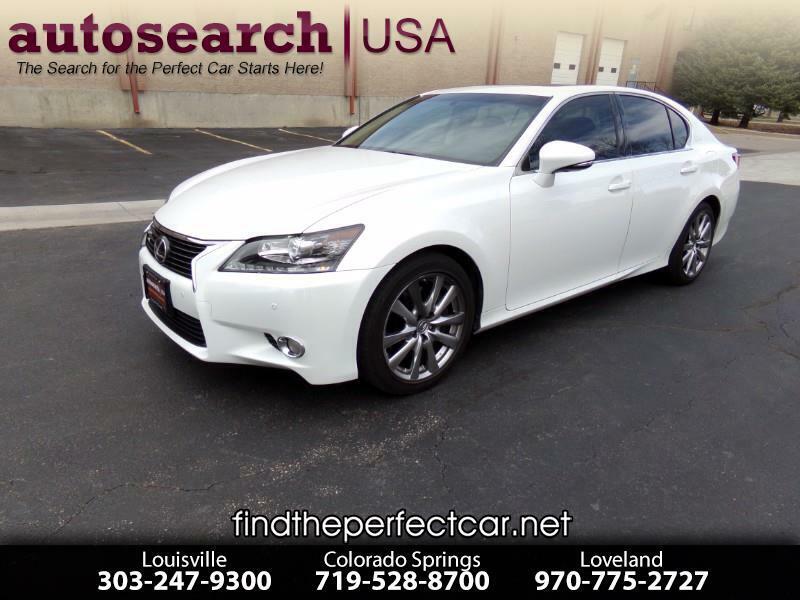 Completely redesigned 2013 Lexus GS 350 includes upgraded luxury package: Fabulous luxury vehicle at a budget price. This is one of the finest vehicles available in the Luxury Sedan marketplace. Driven a low average of 9,500 miles per year this Lexus is in great shape. All maintenance performed and up to date. Complete with all the available options including: leather upholstery, dual-zone climate control, wood trim, bi-Xenon headlamps, power windows/locks/heated electrochromic mirrors with reverse-tilt, moonroof, heated 10-way power front seats, three-person driver memory, power tilt/telescoping steering column, 8-inch color control screen, Optitron instrumentation, Bluetooth phone and streaming audio, cruise control, keyless entry and pushbutton start, AM/FM/DVD/WMA/MP3 HD radio 12-speaker surround sound with aux/USB inputs, Grace note, and voice recognition, LED ambient lighting, locking trunk pass-through, paddle shifters, drive mode select, and automatic electronic parking brake, full touch screen navigation, back up camera, blind spot monitoring, lane keep assist, paddle shifter, powerful 306 HP V6 engine, Premium Package with heated/ventilated front seats, power rear sunshade, rain-sensing wipers. The Lexus GS offers precisely what you'd expect from a Lexus sports sedan: a welcoming environment, hallmark quietude, and extensive features in a less-conservative wrapper with more aggressive tuning. Please note Autosearch USA now has three locations along the front range: Louisville/Boulder, Colorado Springs, and Loveland. Vehicle can be transferred to any of our locations for your ease of viewing, but please call first to set up an appointment to ensure the vehicle is ready, available, and waiting for you when you arrive! All prices exclude tax, tags, & title. Listed price includes D&H fee of $499 & a Documentary fee of $99 on all vehicles except motorcycles. Motorcycle prices include D&H fee of $99 and a Documentary fee of $99. All vehicles have been checked for recalls. Call today to set up your personal showing! Not exactly what you're looking for? We have thousands of other factory-certified options available! Call AutoSearch USA for more details about our nationwide search capabilities for both new and used vehicles. Message: Thought you might be interested in this 2013 Lexus GS. Please note Autosearch USA now has three locations along the front range: Colorado Springs, Louisville, and Loveland. Vehicle can be transferred to any of our locations for your ease of viewing, but please call first to set up an appointment to ensure the vehicle is ready, available, and waiting for you when you arrive! All prices exclude tax, tags, & title. Listed price includes D&H fee of $499 & a Documentary fee of $99 on all vehicles except motorcycles. Motorcycle prices include D&H fee of $99 and a Documentary fee of $99. All vehicles have been checked for recalls.